We provide quality concrete and masonry work to residences and businesses around the Twin Cities metro area. Below is a list of just a few of our satisfied clients that we have provided our services for over the years. Click on any client below to view their full recommendation. 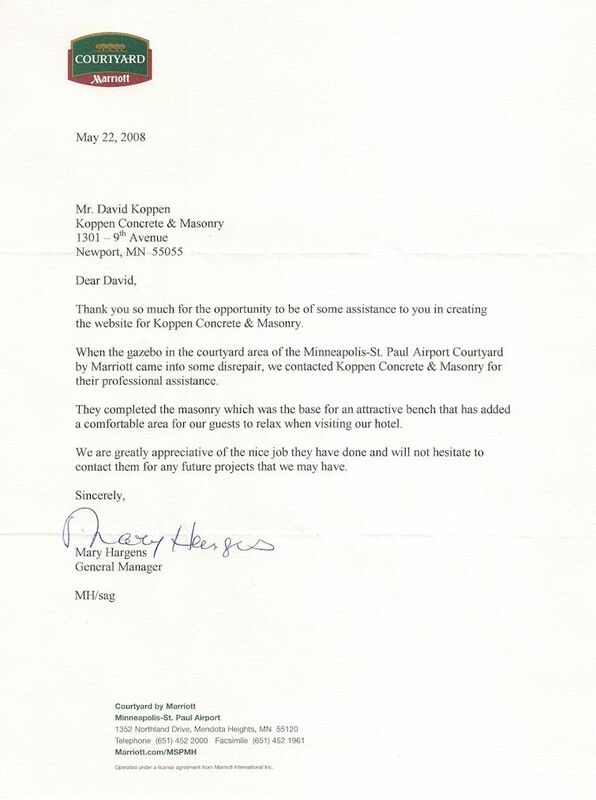 "When the gazebo in the courtyard area of the Minneapolis-St. Paul Airport Courtyard by Marriott came into some disrepair, we contract Koppen Concrete & Masonry for their professional assistance. We are greatly appreciative of the nice job they have done and will not hesitate to contact them for any future projects that we may have." "I would like to thank David Koppen and his crew for the masterful job they did in replacing our old sidewalk and building a solution to our gutter drainage run-off issue. David came up with a drainage system that allowed the water pass through a trough through the sidewalk. Some of this had to be handmade and they did an exceptional job. I would recommend Koppen Concrete & Masonry to any business or individual that wants a problem free project completed with no hassle." 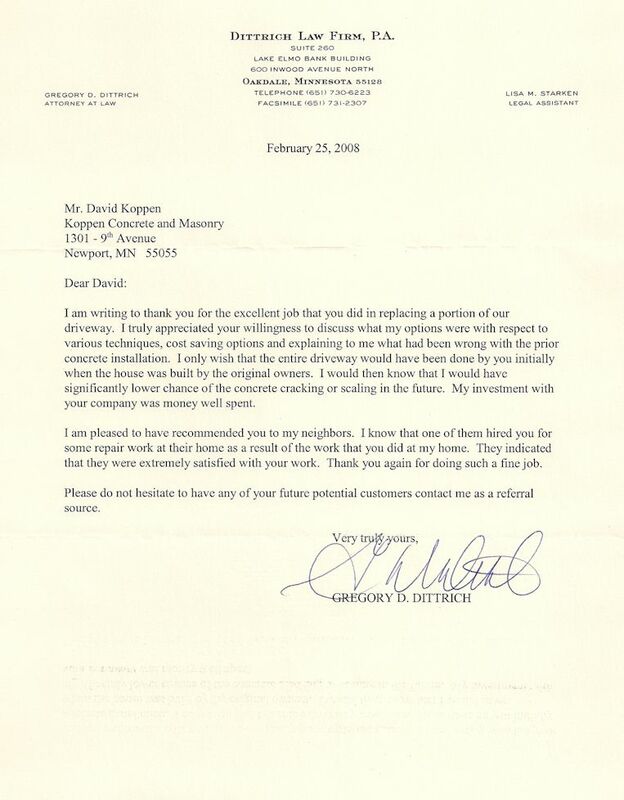 "I truly appreciated your willingness to discuss what my options were with respect to various techniques, cost saving options and explaining to me what had been wrong with the prior concrete installation. I only wish that the entire driveway would have been done by you initially. My investment with your company was money well spent." "We at Crossroads Church would like to thank you for installing the footing and doing the masonry work for the base of our sign along Woodbury Drive. We appreciate the fact that you came in on short notice and completed the project quickly so that we could get the new sign installed. The footing and your brickwork look great." "Thank you for doing such a wonderful job on our deck. You and your workers were very professional and courteous. I appreciate that you put in extra time and care to make sure everything was just right. I will definitely recommend you to everyone I know who needs masonry, concrete or other building work." "I needed to rebuild a crumbling interior foundation corner in my farmhouse basement. It looked hopeless to me since the corner had all been eroded away. Dave Koppen and his staff came and rebuilt the corner foundation better than the rest of the foundation. Dave and his crew did a fantastic and thoroughly professional job. 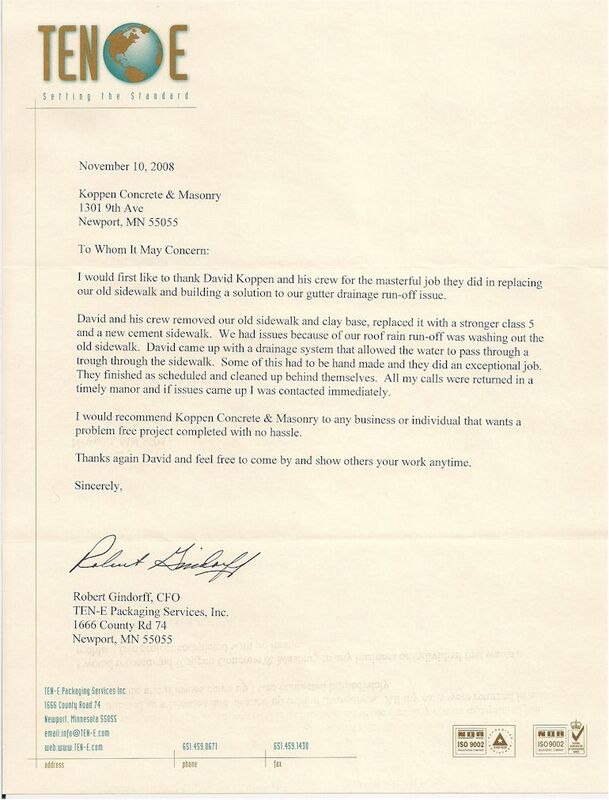 I won't hesitate to call Koppen Masonry and Concrete for any stone or masonry work I have in the future." 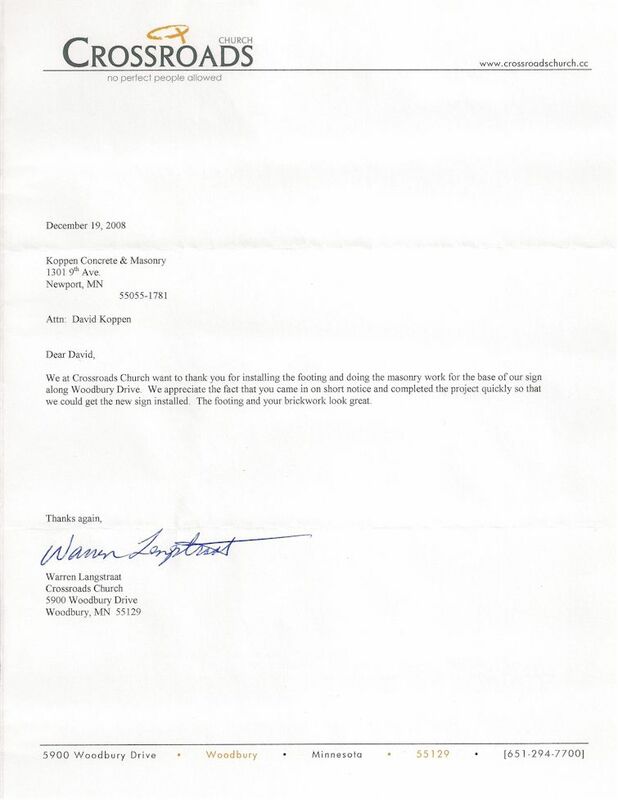 "Thanks for your efforts on our behalf. We appreciate your support." "Thanks again for the beautiful work on our sidewalks, driveway and retaining wall. We are so pleased with the transformation and appreciated all your skill and integrity for a job well done! We will highly recommend you to anyone needing quality concrete work." "The sidewalk looks terrific! Thank you for your special attention to the finishing details as well. I’m very pleased and the sidewalk looks just beautiful." "Thank you for doing such a nice job on our fireplace, it’s just what I wanted!" "Thank you for the excellent work you and your crew performed for us – it was a professional workmanlike job and the results are very very good. I will recommend your company without hesitation." "Thank you for all your hard work. The patios and sidewalk are beautiful! We can’t wait to enjoy a nice fire and enjoy your beautiful handiwork." "I am very pleased with the results. It has been nice working with you." "Thank you so much for the superb job you have done on my garage foundation. Given that the foundation had to be built on a very difficult slope, I am so glad that I made the decision to hire someone as highly experienced as you for the job."